Let's assume, Zetas, that we talk to you as the teacher (You) and the pupil (Mankind). Sometimes the pupil asks the teacher about his interesting things, but the teacher wants that the pupil has asked him about something the main thing. And the pupil in any way will not ask this main question (questions) for the teacher. Yes, you only observers, but if we try to present. So, there is a main question (questions) which people yet have not set, but you want, that it has sounded from somebody? You can name some of them? The rules by which we are required to operate do not allow us to lecture. The issues we can address must be within the context of the questions you ask. The Earth is your schoolhouse, and it is your actions which count during your spiritual lessons. Your curiosity, your requests for counseling, all are initiated by you. Thus, the subjects we address are those on your mind when you give the Call, and no others. My husband and I have chosen a valley area in SE Colorado as our safe location and since we are in the process of moving there, have started noticing anything related. We read an article that was online this week about mustard gas being shipped from a Pueblo Colorado storage facility to laboratories in Ohio and Texas for testing. We were not aware of the facility and it appears they have 2,600 tons of liquid mustard gas stored there. We checked ZetaTalk archives regarding mustard gas and found a Hazard page with the heading "Seattle/Portland" - this is an excerpt from the article talking about a mustard gas depot in that area. "In the very worst-case scenario, the one Army brass fear most - a powerful earthquake followed by fire - a plume of chemical residue could reach as far as Seattle or Portland. If the unthinkable happened, most of the deaths would probably occur in towns along the Oregon-Washington border, small farming communities .. within a 20 mile radius of the depot. The Army calls this region the Protective Action Zone. Opponents of the incineration call it the kill zone." Is the 20 mile radius the safe zone for all the sites or does it depend on how much is stored and if it is stored above or below ground? We have read that there are 7 or more of these sites in the U.S. How should people respond and prepare when they are located near these sites? Or should the real question be along the lines of "this will be the least of our worries at the time of the PS"? We did find a ZetaTalk blurb about herbs that help as follows: "There are even spices that Kill E.coli, and the deadly Anthrax bacteria and other terrorist threats such as nerve or mustard gas can be countered with Garlic, Vitamin C, Melatonin, Rice Bran, Oregano, and Chinese Club Moss." It is hard to believe that herbs can help - these gases are so extreme and deadly - but we plan to have them on hand and use them. Are there any other supplies or special barrier-type ideas that could be recommended to those of us facing such things as mustard gas storage depots close to our safe location? Take heart in that when such depots are established, there are many safeguards against accidental release. Transporting canisters takes into account accidents on the road, where the canisters could get smashed, run over, or get thrown a long distance. When not being transported, the canisters are within concrete bunkers, burried underground, and sealed with many layers in case of any accidental leakage or failure of the packaging over the years. You are unlikely to encounter any problems, thus, even if next door to such a facility. 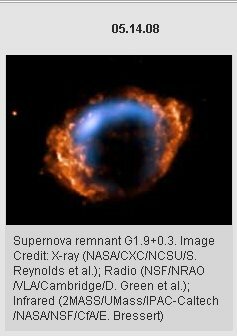 In last week's chat someone brought up a question about a so-called g1.9 supernova close to our sun. And here's a link from nasa about it: http://www.nasa.gov/mission_pages/chandra/news/08-062.html Now, here's Nasa saying to someone's question about the g1.9 supernova, that the g1.9 supernova is a hoax. So NASA just proved that it lied about the supernova, and why would it? I guess the right hand doesn't know what the left hand is doing. [and from another] http://astrobiology.nasa.gov/ask-an-astrobiologist/question/?id=11926 Question: I read on the internet that G1.9 is brown dwarf star and also perhaps a supernova remnant. If this is a brown dwarf star, how close is this thing going to get to earth? I read that Spanish artronomers who call themselves the StarViewer Team, claim they discovered a brown dwarf almost twice the size of Jupiter and just beyond our furthest planetoid, Pluto. Answer July 19, 2010: You appear to have fallen for a hoax. The story about a group of Spanish astronomers discovering something twice the size of Jupiter in the solar system just beyond Pluto is pure fiction, without any core of truth. If there were any such object, astronomers would have discovered it decades ago in both infrared and visible sky surveys. [and from another] http://www.nasa.gov/mission_pages/chandra/news/08-062.html Chandra Uncovers Youngest Supernova in Our Galaxy Supernova remnant G1.9+0.3 [May 14, 2008] The most recent supernova in our galaxy has been discovered by tracking the rapid expansion of its remains. This result, using NASA's Chandra X-ray Observatory and the National Radio Astronomy Observatory's Very Large Array, will help improve our understanding of how often supernovae explode in the Milky Way galaxy. We mentioned on the chat last week that NASA and the group of Spanish astronomers would appear to be arguing with each other so as to disguise the fact that they were actually working together. G1.9 was supposed to be a late discovery that NASA could use to explain the current Earth changes caused by Planet X. NASA was waiting to see if this hoax would pass, when much was made of it in the public media, but as the hoax was gaining speed on the Internet NASA began to get nervous and decided to back out. But as recently as May 8, 2010 NASA was backing this hoax, showing they were in partnership with the hoaxsters! "Chile will deal with tidal bore, as if the tsunamis and tidal waves cannot roll inland they will climb up into ravines. They will likewise be forced up river outlets and thence spread in the inland valleys. If one can only be 50 miles inland, then they should be at least 400 feet above sea level, to be safe." My question is : As South America is ready to roll, is there a possibility that the rivers change their course? I ask this, because we are leaving for a little town in December, where there is a river that flows from the Andes mountain, afterwards joins another river, which gets together to another one which finally ends in the ocean. I wonder if rivers may change their course and our "safe" river may get all the water from the other rivers and then, become a dangerous one. The name of the river we consider "safe" is Río Claro, which is in Yumbel. The next river's name is Río Laja and the last and one of the most important rivers in this province is Bio-Bio. This Bio-Bio river ends up in the Pacific Ocean and this river surrounds the main city of Concepcion and lots of little towns here in the center-south of Chile. [and from another] It is only at some 32 miles from the coast line facing Tome, and it is only at some 328 ft. altitude. The highest hills seem not to be higher than some 1,100 ft. high. The Claro river is at some 100 meters altitude, which is only 328 ft, which is much lower than the suggested 675 ft minimal altitude. The next issue I would like to mention os that I do not think that the few 1000 ft high hills next to the coast line will be able to stop a 600 ft high tidal bore, which may very well climb up these hills and keep going. The other thing is that there are plenty of low altitude ways which the water may use to go deep inside the central valley at that position. Finally, the large Bio Bio river kind of too close, just as the Claro river is, and Yumbel is sitting next to river beds. I would think both of those river beds will be flooded. West from Angol City, on the straight line running between Angol City and Lebu City, there are high grounds which go up to some 4,000 ft at some places. I believe there will be no mountain erection process there, since those mountains do not show steep heights but rather soft slopes, and those mountains should be older than the Andes. Their distance to the sea side is again almost the same you will have at Yumbel, but these mountains are much, much higher. Those mountains should have many water sources, and you'll have a lot of woods, perhaps hunting, and I think the soil should be very good to grow an orchard there. Your chosen site is clearly not going to be safe, but will be awash with tidal surges coming up from the coast along the river banks. All rivers that empty into the sea are channels for a backwash from a tidal wave, and here all the rivers that empty along with the Biobio are going to be flooded well above their banks! As we stated, for safety along the Chile coastline, you need to be 50 miles inland and 400 feet high. Your spot computes to 32 miles inland and only 328 feet high. You would be washed over with the tide from the Pacific! A few new CCs in England, Wiltshire. Reported 8th August. What the Zetas can say about them? Any comments, if there is something especial? Designs where overlapping circles are crowded to one side are being repeated for emphasis because this design has proved to be one that humans understand, intuitively. The normal rounded appearance of a magnetic field, where magnetons spew out of the N Pole and wrap in a rounded manner along the field to enter the S Pole, changes when two magnetic fields clash. Mankind is familiar with this concept when looking at the simulation of the Earth's magnetic field, and seeing it blown back away from the Sun into what look like wings. During the clash of magnetic fields between the Earth and Planet X, this distortion where wings are on the far side from the Sun but the Sunside shape is rounded will change. This has already occurred, of late, when a portion of this bowshock became deformed. Consider the bowshock, the tight rounded shape of the Earth's magnetic field facing Sunside, to be the point where the circles in these crop circle diagrams are crowded to one side. Fano, Italy is the simplistic form. Pewsey Whitehorse is showing what happens to the Earth during this magnetic onslaught when it attempts to lean away into the 3 days of darkness or into opposition. A flip-flop or reversal is implied. Stanton Bridge is depicting the lean to the left, with the inevitable recovery which can be a lean to the right. How do the visitors deal with pets when transferring a contactee? For example, my kitty sleeps in my arms at night and I wonder how they prevent him from freaking out/attacking when a visitation occurs? Just curious as last night he jumped up randomly and seemed like he was seeing something I couldn't. Pets such as cats and dogs do not have the split brain that humans have, so do not have a subconscious and a conscious. Thus, there is no recording of visitations only in their subconscious, as we do with humans. Since even if giving out friendly vibes, to most pets the visitors would be strangers and thus they would react as though to a stranger - by barking, hissing, tail wagging, or running away. To arrange missing time and to maintain the Element of Doubt, we would not want to leave a memory in the household of a dog barking, a cat hissing, or the dog jumping up and down as though greeting an invisible man. Thus we use our skill at influencing brain chemistry, from afar, to put pets into a state of calm. This is done even before approaching the contactee or landing a ship. They may still look at us, but not be alarmed or active. Many contactees report, during recall, seeing their pets simply lay down as though to rest, very nonchalant about the whole matter. New CC in England, Wiltshire - at Horton, near Devizes. Reported 9th August. http://www.cropcircleconnector.com/2010/horton/horton2010a.html I think that here there is a reminder on trimesters since there are triangles. But round the edge those 6 pieces seem to have a leading edge or something? Would the Zetas make comments on this? This design represents the magnetic trimesters, without a doubt. The triangle in the center is the clue. Mankind has recently become aware of what they called a magnetic river just outside the solar system, which we have explained is a part of a very large magnetic field, a flow line of this field, which the solar system is within. This is the reason the Sun and all the magnetic planets in the solar system align in the directions they do. 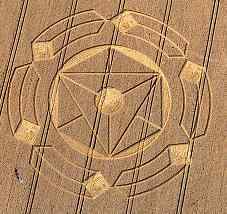 A careful check of this crop circle in Horton shows that the ribbon wraping around the circle is not evenly spaced. In some cases, the triangle points or the line at the mid-point of the triangle sides are pointing ever so slightly ahead of where the ribbon terminates in a solid leading edge. We mentioned recently that the magnetic trimesters do not end exactly at the end of an April, an August, or a December end, as of course the Universe is not laid out according to the Gregorian calendar. Here you have confirmation of our statement, in the Horton crop circle. NASA relied upon Global Warming to explain the erratic weather until this was exposed as a lie, selective cherry-picking of data. They certainly planned to use the approaching solar maximum as a cover and are attempting to use this still, but the Sun is not cooperating. They must announce solar activity prior to an impact on Earth, as it is well known that solar flares take days to reach the Earth. Thus, their tendency has been or may be to continually cry "wolf" but then the public would get suspicious. Already this issue raised its head, with a reputed M class flare announced and then seemingly retracted. We have stated that NASA would claim errant asteroid swarms if the moons of Planet X were sighted. But when the Moon Swirls and String of Pearls are caught on SOHO, they have few options to explain them. Taking SOHO offline for days at a time, unannounced, was done, but in the end the problem did not go away and the onslaught of information showing up was beyond their ability to edit out. Even at that, editing lines became obvious, as did attempts to alter older SOHO images on their databanks. Colliding asteroids was briefly used to explain Moon Swirls, in the media, but the question begging to be asked, then, is why they are now colliding all the time and did not do so in the past! G1.9 has failed to fly, after NASA was fully prepared to use it. Now what? As long as control of the media can be maintained, NASA will keep on with the same ridiculous cover stories. And if Planet X appears in the sky, as a Second Sun that many can see, day after day? An atmospheric anomaly, an echo, some new term they will made up. They will keep up with the stories until the day that a wobble proves that a body is nearby, causing the Earth to totter. Then the doors will be shut, the phones not answered, and they will have fled to their bunkers. Breaking news just announced on MSNBC: A small corporate jet crashed over Dillingham, Alaska, and on board was Sean O'Keefe, NASA Administrator under George W. Bush as well as former Sen. Ted Stevens. There were only about 8 or 9 aboard this plane. O'Keefe is now CEO of EADS North America, a subsidiary of the European aerospace firm EADS, and it's being reported the group was en route to a "fishing lodge", a 'retreat' of some kind. Was this an assassination of some type, considering Mr. O'Keefe's high-profile position in the Coverup along with a disgraced pork-barrel politico known for bringing home lots of bacon, or simply a karmic accident? Yes, the weather was bad, but considering how reviled NASA is I can't help but suspect foul play. [and from another] http://www.nasa.gov/about/highlights/AN_Feature_Administrator.html Nominated by President George W. Bush and confirmed by the United States Senate, Sean O'Keefe was appointed by the President as the 10th Administrator of NASA on December 21, 2001. [and from another] http://ctip.maxwell.syr.edu/papers/6.html Appointed to cope with a huge cost overrun on the International Space Station, he soon was engulfed in the Columbia Shuttle accident and its resultant investigation. Subsequently, he engineered a presidential decision that NASA return to the Moon and go eventually to Mars. He also sought to terminate the immensely popular Hubble Space Telescope. [and from another] http://www.whnt.com/news/nationworld/sns-ap-us-alaska-plane-crash,0,1842392.story The Guard was called to the area about 20 miles north of the town around 7 p.m. Monday after a passing aircraft saw the downed plane. The plane was being flown - from one lodge to another - using visual flight rules, and didn't need a flight plan. [and from another] http://thewesterlysun.com/news/article_1a395aae-a49b-11df-aee4-001cc4c002e0.html The National Guard in Alaska reported a private medical team was dropped near the crash site by commercial helicopter. Four of nine people aboard the plane survived. [and from another] http://www2.timesdispatch.com/news/2010/aug/10/18/ A team of Good Samaritans hiked into the crash site Monday night and provided medical aid until rescuers arrived. [and from another] http://www.huffingtonpost.com/2010/08/10/sean-okeefe-dead-former-n_n_677314.html Sean O'Keefe Dead: Former NASA Head And LSU Administrator Reportedly Dies In Plane Crash First Posted: 08-10-10 02:09 PM | Updated: 08-10-10 02:13 PM [and from another] Ex-NASA chief, son survive Alaska plane crash http://news.yahoo.com/s/ap/20100810/ap_on_re_us/us_alaska_plane_crash0_keefe A former NASA spokesman says ex-NASA chief Sean O'Keefe survived the plane crash in Alaska that killed former Sen. Ted Stevens. Glenn Mahone (Muh-HOHN') says O'Keefe's teenage son, Kevin, was also among the four survivors. The plane crashed Monday night near a remote fishing village in Alaska, killing five. The former spokesman for the space agency says he has talked to O'Keefe's family. They told him that O'Keefe and his son had some broken bones and other injuries. [and from another] http://news.yahoo.com/s/ap/us_alaska_plane_crash The cause was not immediately known, but weather is one area investigators will examine. Lodge operators called the fish camp at 6 p.m. to inquire when the party would be returning for dinner, but were told that they never showed up. Civilian aircraft were dispatched, and pilots quickly spotted the wreckage a few miles from the lodge. Former NASA spokesman Glenn Mahone said O'Keefe, 54, and his son had broken bones and other injuries. Regardless of what the official report on the cause of the crash might be, this was an assassination operation with more than one target. Clues that this was a rigged crash are that no radio contact alerted authorities that the plane was in trouble or had crashed. Even a small plane with mechanical trouble has time to send an alert. The second clue is that the crash was not discovered until seen from the air by another plane overhead. This supposedly accidental discovery allowed the operation to have men on the ground to check the survivors ahead of any official rescue operation. It was reported that "Good Samaritans" were in the area, the first on the scene. Who are these people, and how did they just happen to be in these rugged mountains? And lastly, the delay in reporting who survived or did not survive. Clearly they were in radio contact of some sort with the rescue team who was there, as the number on the plane, the number dead, the number with injuries were being reported. Why the delay in frankly saying that these two individuals were dead? Because death was still being arranged, and just who was dead on arrival and who died in the rescuers arms was not to be reported until the story could be carefully arranged. Old men do not survive a shock, and can have secondary heart attacks, as is well known. Why were these two men targeted, at this time? Ted Stevens, as an old timer in the Senate for many years, had more than heard the rumors. He was being approached by many looking for a safe location, with Alaska known to be a site we, the Zetas, had predicted would be tropical. More than that was the oil being pumped nearby, so for those in the elite this translated to ready fuel for their enclaves. Ted was cocky and sloppy, and thus had been caught in a bribery sting. He was using his claims of being an insider, able to make arrangements in Alaska, on the new deal - arranging bunkers for the coming pole shift. He was assumed to be sloppy in this too, thus giving away the truth, cracking the cover-up, and thus was scheduled for assassination by those elite who want the public kept dumb until the last possible moment. Sean O'Keefe likewise had a mouth. When he resigned from NASA, during his press conference, he was morose and implying that he was a scapegoat. He fact, he was a little drunk. Thus, as someone who was likely to drink and talk, and certainly in the know about all the plans the elite had, he likewise was scheduled for termination. Sean O'Keefe knows of the plans for the elite to go to Mars, to the Moon, and to take the Hubble offline from public viewing so any chance of Planet X being seen would be minimized. These types of quickly arranged funerals will be on the increase, as tensions rise. Certainly someone of Simmons age and red face could be assumed to be suffering from high blood pressure and heart disease, and this was the case. However, this was not the cause of his sudden death. A heart attack at home, where no medical diagnosis could be given, is very safe. This is accomplished by a shot, a needle inserted into a wrinkled area such as the armpit, where a puncture would not be noticed. Spasms of the arteries around the heart can occur, and leave no mark afterwards, but clogged arteries and a stress ridden life would make him a candidate for this type of heart attack. He was killed by those in the oil industry who resented his switch, considering him a virtual traitor. The public was not to be aware of the many leaks in the Gulf, because of the cover-up over Planet X and the stress it is causing on the N American continent. The public was also not to be aware of the many additional leaks near the BP well, and this Simmons was adamant about. BP authorized his death, and paid for it. What is known is 24 out of 49 or so days. How long will the slowing rotation take, and how long will the Earth linger in her static lean to the left? We learn that it is a bad thing to kill. But we all kill bugs for example. And we are designed to digest meat as an option. So what will be the konsequences for my soul if I kill a man / animal / fish / bug / plant / krystal? I know, this depends very much on circumstances and motives and it is always my personal decision. Could You recommend a guideline? Where can a line be drawn? Is there something we should know? All who are Service-to-Other hesitate to harm another life, even if that life is plant life. Amoeba and bacteria act to defend themselves, but feel no pain, lacking a nervous system. Fish, fowl, and reptiles likewise act on instinct but do feel pain, which is a clue to urgency and a guide in what direction to move. However, they do not feel anxiety, a sense of dread or hopelessness. Mammals, including dolphins and whales, have strong nurturing instincts, which involve feeling anxiety for the young. Without this anxiety, a feeling of dread or remorse when things go wrong, the young would not get the protection needed in order to survive. Is it appropriate to kill some form of protein in order for yourself to survive in good health? Until you reach the point in your development where you can manufacture these proteins and other substances in the lab, you have no choice. We have stated that early Zeta ate bugs and moss. Our advice is that whatever form of protein you chose to consume, you kill quickly, and stay away from mammals if this is your leaning. Should you shoot a bear if it is attacking your family, or another man if the other intends to do harm to your family? We have addressed this issue elsewhere, and explained that even a Service-to-Other entity can find itself in this position, and should not hesitate to act. To do less is to doom innocents to harm. Will all building structures be destroyed in the pole shift (if not before), due to earth movements, water, wind, and? Even well-built homes in safe places (such as the Appalachians)? I am a relative newcomer, though I keep reading and learning. The combination of magnitude 9 earthquakes and hurricane force winds, worldwide, will bring down most structures. This is more than simple earthquake damage, which can be quickly ascertained with a little research. How does a home such as yours withstand a magnitude 9 quake, under earthquake simulation tests? You would be stunned to learn that few, if any, survive. Even homes and buildings in high-risk areas do not withstand the test of a real earthquake. The 1994 Northridge earthquake in California was a mere 6.7 but leveled buildings. The 1995 Kobe earthquake in Japan was a mere 6.8 but flattened freeway overpasses and leveled buildings. Magnitude increase is not a linear increase, it is exponential. Few structures even in such earthquake zones are designed to withstand the horizontal and vertical thrusts that can occur. Now add to that the hurricane force winds. Most home builders assume that gravity will continue to drawn in one direction, down, and do not assume the homes they are building will be thrown off their foundations. Horizontal pressure only is assumed. Thus when the quakes hit, throwing the homes off their foundations, there will be hurricane force winds from some direction to catch the jagged edges of the home and toss it like so much litter in the direction the wind is blowing. Assume your home will be dashed, and seek shelter, as we have advised, in a trench. Afterwards, come out and see what you can salvage. The Zetas stated within two years of the passage ocean levels will rise 675 feet. They warned this will back up drainage systems. Understanding that a multitude of variables exist from system to system, can they be more specific in determining a general rule of thumb for the backup? For instance, roughly, how would a large mountain lake 300 miles from the coast and 2000 feet elevation be affected? What kind of rise in water levels can be expected with such a scenario? Certainly the lake you describe would be unaffected by a rise in sea level. Water seeks its level and unless a natural barrier exists that would keep the sea from encroaching into land, all water worldwide will ride at 675 feet above the current level. Shorelines will erode. Rivers that empty into the sea will become inland bays until the river beds themselves are above the 675 foot level. Where coastal hills or mountains exist that would presumably guard against an influx of water, the rising sea level will find a way around or under such barriers to flood and create inland lakes. River beds are a favored way for inland lakes to be formed, as the river beds are lowland and themselves will flood. Even where dams have existed, these will fracture during the pole shift and open this path to lands above the dam for flooding. Any sewage system that relied on drainage into an area now flooded to the 675 foot level will back up too, and pollute drinking water secured from the area. Independent lakes at high altitudes will be unaffected, as they are today with the current sea level. Will Asteroid 242643 cause any damage to earth, if so will it be northern or southern hemisphere? Clearly this particular asteroid is not expected to come anywhere near the Earth, as the recent near pass is 60 lunar distances away. The term Near Earth Asteroid was coined for those asteroids which are far outside of the Asteroid Belt, and thus have the potential of impacting Earth. But should an asteroid approach Earth in a trajectory that would imply impact, what then? We have stated that the Council of Worlds would not allow the Earth to be destroyed by an errant asteroid or other such happenstance. The Earth is scheduled to be a schoolhouse for 4th density entities for a long, long time, and is a world full of life, a treasure. This statement shocks those who beg for the pole shift to be averted, for Planet X to be pushed aside somehow. The difference is that the passage of Planet X is a natural event, periodically happening to the Earth, and one which all reincarnating souls are being counseled to address. It is not an extinction level event, but at most the end of an incarnation. To understand the Council's logic, think as a teacher. You want the schoolhouse to continue. You do not want to remove the opportunity for self study, for learning, the opportunity to react to a crisis and by so doing either reach out to help others or withdraw to only save the self. Stopping the pole shift would do the latter. It would remove an opportunity. It is for this reason that tornadoes, cancer, starvation during drought, and lightning strikes are not prevented on Earth, which is a schoolhouse. If an asteroid is small, and would be nothing more than a glorified fireball, then it would be allowed to impact the Earth. But an extinction level event or long term disruption of life on Earth would not be allowed, as then the lessons stop! The Bulgarian Institute of Meteorology announced that in the last several days the Black Sea temperature (officially measured along the Bulgarian coast) is 30 degrees C and above, while air temp. is 25-34 deg C. Is this heat effect due to the grinding of the plates or is there another reason for it? And another related question. 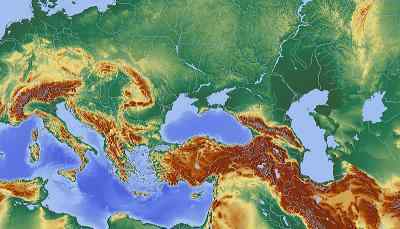 As the Black Sea is the worlds' largest water body containing hydrogen sulfide (highly toxic and flammable gas), found in depths of 80 m underwater and below, can we expect explosion of this gas due to tectonic plates movement or due to other events prior to and during the PS? Can we expect devastating explosions of this gas, sweeping the Black Sea countries, firestorms due to that, acid rains? What will be the effect of the inevitable "stirring" of this highly flammable gas in Black Sea? On Internet there are photos of giants. http://s49.radikal.ru/i124/1008/36/e7b83fdb6c42.jpg They are our former owners? They are Annunaki and this photos true? To all: This theme can be already solved on the English Internet? On Russian Internet there is not enough information. These are clear frauds, with human figures superimposed on the enlarged photo of a human skeleton. 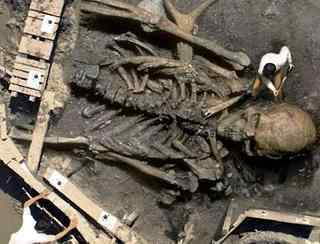 If such giants were indeed discovered, where is the media, the circus extravaganza, the large tents with entrance fees making those who discovered and retrieved such giants rich! Frauds, all of them. What lies behind the concealment of piránimdes of Bosnia? I ask because a discovery so important that changes the story that is now recognized as an officer, should occupy front pages of newspapers and be first television news reports, but it is not. The news is kept in the nebula, despite the evidence, the scientific community refuses to accept it. Are we facing another conspiracy? http://www.bosnianpyramid.com/images_new/BosnianPyramidOfTheSun/BosnianPyramidofSun.jpg I remember something I read about Egypt, where they say they have discovered other pyramids and ruins that still remain hidden. What interest behind it? Why the mystery? 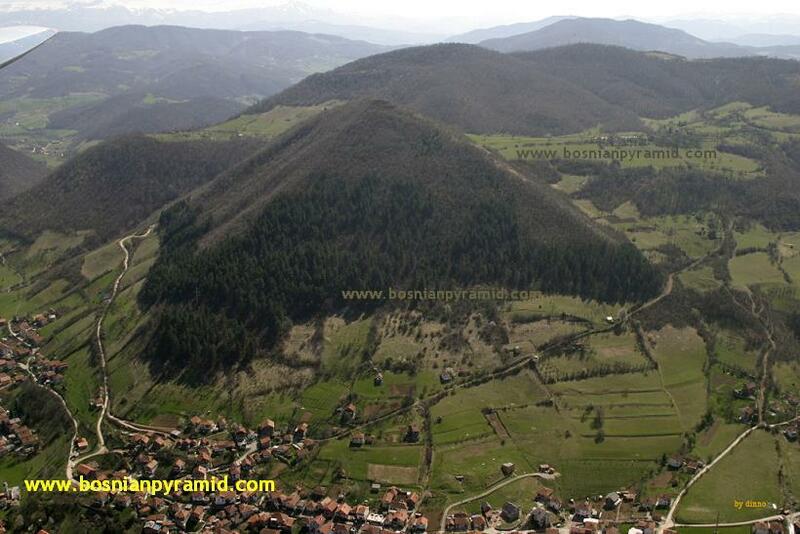 Yes, the region around Bosnia has some legitimate ancient pyramids, but not all hills are a former pyramid. There are buried pyramids that have been discovered in Australia, China, and certainly in Central America. The buried pyramids in other parts of the world have not yet been discovered, and we decline to mention them as the fascination with the former handiwork of the Annunaki is altogether deplorable. These were not gods, but peers of mankind, utilizing intimidation of emerging man so as to continue to enslave man. Gods do not need to rely upon intimidation such as ripping beating hearts of out living breasts, for all to see. Other than the Great Pyramids in Egypt, which were sighting devices, pyramids were built as imposing structures in order to intimidate emerging man. The age of these structures only indicates the relative time period when the Annunaki were in the area, mining for gold or using the area for transport or storage. These ancient pyramids are of no more importance than mankind's current strip mining activity. What effect will PX and the current state of the wobble have on the upcoming "peak" hurricane season due to the storms coming off Africa into the Atlantic? They say all indicators point to major activity. Will they be proven wrong like last year leaving them befuddled yet again? Other than to state how the wobble might impact the hurricane season, we are not allowed to comment.Up until this past month, the wobble had been a slow steady roll in a Figure 8 pattern, predictable. When the Sun was over Europe and Iran, the globe had tilted its N Pole to the left, compression the air over the Atlantic toward the center of the Atlantic. Then when the Sun was over the Americas, the tilt was in the opposite direction, tilting the N Pole to the right, again compressing the air over the Atlantic to the center of the Atlantic. This tended to keep hurricanes centered in the Atlantic, not making landfall. With the slow steady wobble pattern ending in July, the end of the Serpentine Dance, and the development of a new characteristic - a violent and sometimes rapid movement into temporary leans to the left or into opposition - this will now change. What the effect on the hurricane season is we cannot precisely say as this would be predicting the exact nature of the rattling wobble at any given time. But the overall effect is likely to be extreme unpredictability. The hurricane path will appear to be heading in this direction, and then will change. This is more likely than not, for any given hurricane. http://www.cropcircleconnector.com/2010/Spellow/Spellow2010a.html [and from another] On August 12, 2010 we had a 6.9 in Equador, quite deep, with a 7.5 in Vanuatu the day prior, and warnings for Italy as many 4+ quakes occurred there. The live seismographs went dark, even though they had only recently been tuned down, with Venezuela showing a double shudder 12 hours apart. Yet the magnetosphere looks positively normal, and a careful check of the sunrise position showed no particular lean. If the globe is not leaning, or in the grip of a magnetic storm, why the quakes? 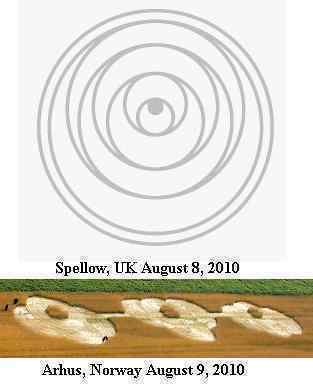 Is there some significance to these two crop circles, with a similar appearance, being laid only a day apart? They both show the new wobble pattern we have been describing, where the slow roll of a daily wobble in the shape of a figure 8, the Serpentine Dance, no longer applies, but is augmented by what we have termed a pattern of the Earth being rattled. The contents of a box, being shaken. Translate this to the Earth, which has multiple dictates on multiple parts, at times in conflict. During the last weeks, the Earth slows her rotation to a stop because a surface magnet, the Atlantic Rift, is gripped and not allowed to come out of alignment with Planet X. The core, meanwhile, protests! Thus during the week of rotation stoppage the Earth moans in her agony, with these conflicting dictates. When the Earth leans, temporarily, to the left or into opposition, are all her parts in agreement? If, for instance, the core wishes to lean into opposition, for comfort, but the crust find the presentation of the magnetic S Pole on the surface not aligning nicely with the demands of the magneton flow from the N Pole of Planet X, what happens? There is tension, in the magnma, which may merely roil but can result in a snap. This snap, where the magma releases its hold on the crust, translates to plate movement. This is why we warned that the end of the Serpentine Dance in July would result in plate movement. Look closely at the two new crop circles in question. In Norway the center circle, identified with the tuft of wheat still intact, is in different places vs a vs the other circles, which represent the various places where the surface would like to be! The rattling wobble takes many forms, and switches about, sometimes within hours, and certainly cannot be predicted. We know this planet as the skyworld, the place we come from. They are revolving around our sun for the fifth time since we been here recording. If you were on that world one revolution of our sun would only be 1 year. Peacemaker left to the skyworld and said he would return when it comes back. I think he will be 1 year older than when he left. They are in a different time/space dimension. Any comments? Time passes with the same parameters on Planet X, Nibiru, as it does on Earth. Where Planet X does not have a day or night, out in space, but continuous dim light from the deep rifts in its ocean beds, and where the Annunaki consequently do not sleep, their life span is approximately that of mankind. But the legends you speak of are not literal, but figurative. There are however remarkable correlations with the periodic passage of Planet X and American Indian lore. The Christian religion, and even Islam, speaks of a time of peace when Jesus will return. We have explained that this too is not to be taken literally, as it is speaking figuratively, and relates to our statement that the Earth of the future will be a home for those in the Service-to-Other. First time posting. I am curious about the new way rules are being enforced right now: http://www.kfor.com/news/local/kfor-news-recession-increse-speeding-tickets-story,0,7660163.story Police departments are ticketing more because they are getting grants to ticket more and to raise revenue, like an extra tax on the population. While social rules were set up to protect people, in our limited understanding, it's clear that others use them for control and to raise revenue, which is contrary to service-to-other. After reading much of the Zetatalk website, one clear characteristic that you relay about Service-to-self societies are their reliance on rules to make people obey. I am wondering if there are any form of "rules" in the service-to-other as we are told that social rules help to govern moral or right behavior. Thus, we all can agree that killing is bad and there is a law against murder, but would that law be seen as "Service-to-self" by the Zeta? How do we protect ourselves and others from abuse of rules in the coming times when the majority of people feel that rules help to govern society in a beneficial manner, even when they are clearly being abused to raise revenue? There are few clear cut lines. What Service-to-Other communities have is frequent conferences, almost continuous, via telepathy. Since such conferences obviously cannot reach out to the edges of the Universe, there are rules, or rather edicts, that the Council of Worlds or its equivalent in other parts of the Universe provide. Even then, these edicts are delimited and not broad, such as what alien group should do genetic engineering on a particular young world, or what approach should be used during this process. Such an edict does not apply to other young worlds or genetic engineering projects, for instance. Disagreements among those in the Service-to-Other is uncommon. If a given individual or even a minority faction disagrees with the consensus of the whole, they accept this and do not try to interfere. They may decline to take part in an action, however.